It was a challenging week in the stock markets. Maybe we are due for the first failed lunar period of 2015. 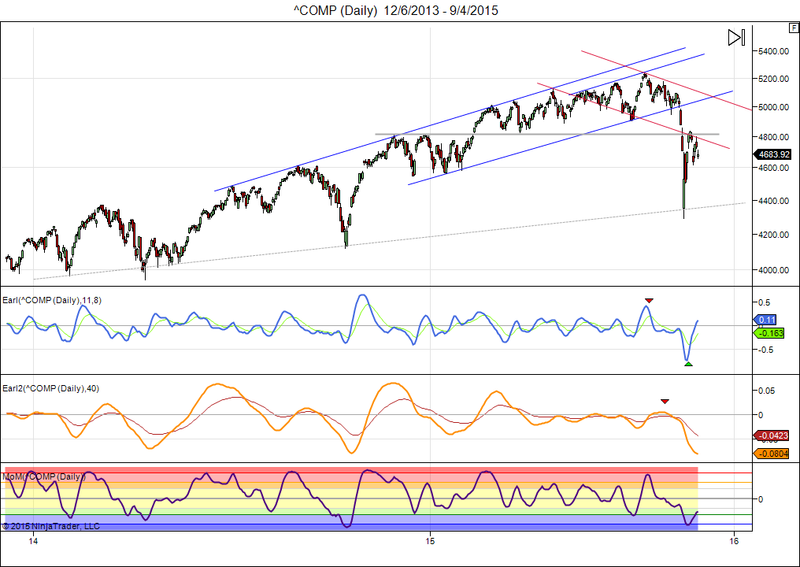 The Nasdaq had a nasty downturn in the last days of the week. Since the July record highs we see a lower low and a lower high on the chart, something we haven’t seen on this scale for quite a while. That doesn’t have to be the end of the world, but for me it is a good reason to turn into “show me” attitude. My technical indicators have turned back down, and now I just sit back and let the market prove to me that it has the strength to recover from this “dip”. If it doesn’t then the chart will start looking ugly soon, because what looks like an intact up trend (as given by the blue channel) would quickly change into a visible down trend (shown by the red channel). That would mean a drop to 4700-4800 area, if not worse. 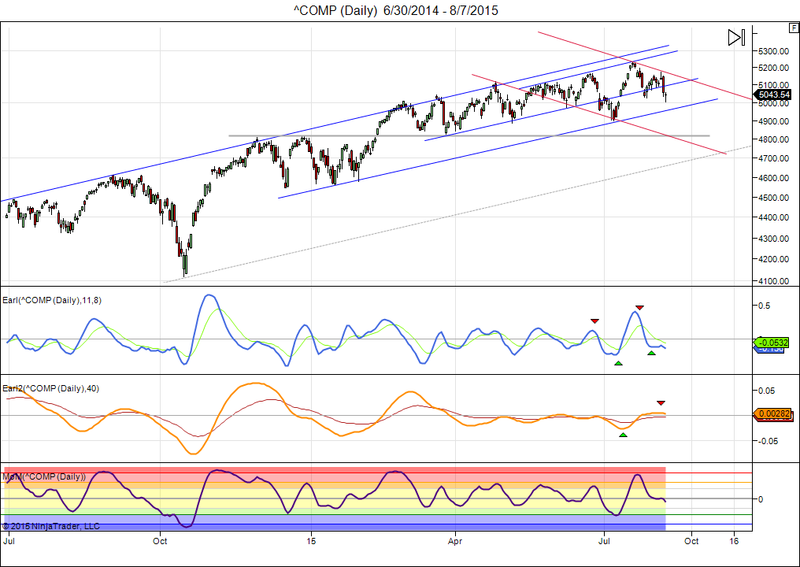 A move above 5200 would invalidate the potential down trend channel and tell us that the bull market is still on. My weekly outlook based on reversal levels has also been giving warning signs for over a month. This may pass without much further damage, as it often does, but there is no way to tell. Even the worst of bear markets start with a few innocent looking down days. 1) Green mountains, covered with more or less ice (grey). The more green the more bullish the stock is behaving at that point. Stocks in healthy bull markets show plenty of green mountain, often uninterrupted for months. Some ice on the mountain is OK, but too much ice (and little green) means the continuation of the bull move is in question. If all green disappears it is usually better to sell the stock. 2) When there is no ice left on a mountain you see a red line (e.g. May 2015 in the chart), or “lava”. This indicates the market is very hot and probably at or near an important peak. A stock can stay hot for weeks, so don’t sell immediately. I usually sell half or all of the position as soon as the lava disappears. 3) Open water appears when no green mountain or even grey ice is present. This means the stock is dead in the water, bulls are too weak to take it higher and the stocks is probably grinding down (e.g. July 2014 in the chart). As you can probably guess, there is no good reason to own a stock that is dead in the water. We wait for green grass to tell us that a new bullish phase could be starting. 4) Sometimes you see icebergs in the water, small grey spikes without any green in them (e.g. Sep 2014 in the chart). Icebergs indicate that there is a rally attempt, but it is so weak that no green grass appears (no growth). Before you know it the stock is falling even further, if not sinking like the Titanic. Stay away from icebergs. 5) Small islands (e.g Oct 2014 in chart) are not much better than icebergs, usually followed by a further drop. But sometimes a small island is soon followed by a big green mountain, so they can be like the first green sprouts after a long winter. 6) In open water you will sometimes see floating ice (white lines in the blue water at the bottom, e.g. Aug 2014, Nov-Jan 2015 and Jul-Aug 2015). When you see floating ice it means hell is freezing over for the given stock. There is often floating ice at major bottoms, but not every case of floating ice is “the bottom”. If a stock is crashing it is best to wait until the floating ice disappears if you intend to buy near the lows. To play safe it is even better to wait for green grass if you want to buy after a period of floating ice. Apple has been green bullish most of the time. It was dead in the water around the new year and has again gone dead in the water since May-June. You didn’t miss anything if you sold when the green grass disappeared. The S&P had lava in July last year, and saw floating ice at a few major lows. Since the start of 2015 the green bullish energy has been weak with plenty of small islands. An iceberg in June gave way to a quick dip and since July we see more green bullish. If this can be kept up then the market should go higher. 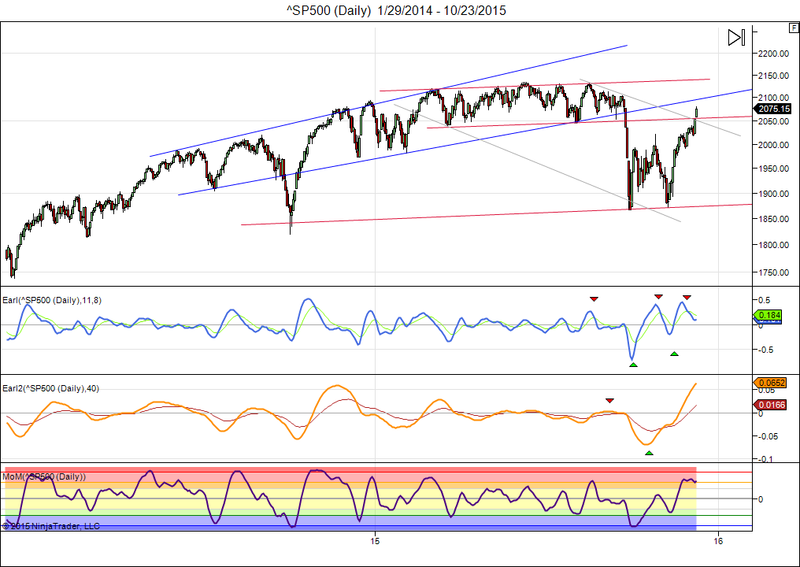 If it doesn’t then the S&P will probably go dead in the water again. I intend to post some iceberg charts from time to time, as it is a nice way to add some color to my articles. Hope you like them. Feedback is welcome as always. PS: adding iceberg chart for FTSE 100 per reader question, see comments below.